I did a lot of research about Cuba before I stepped foot into the country. 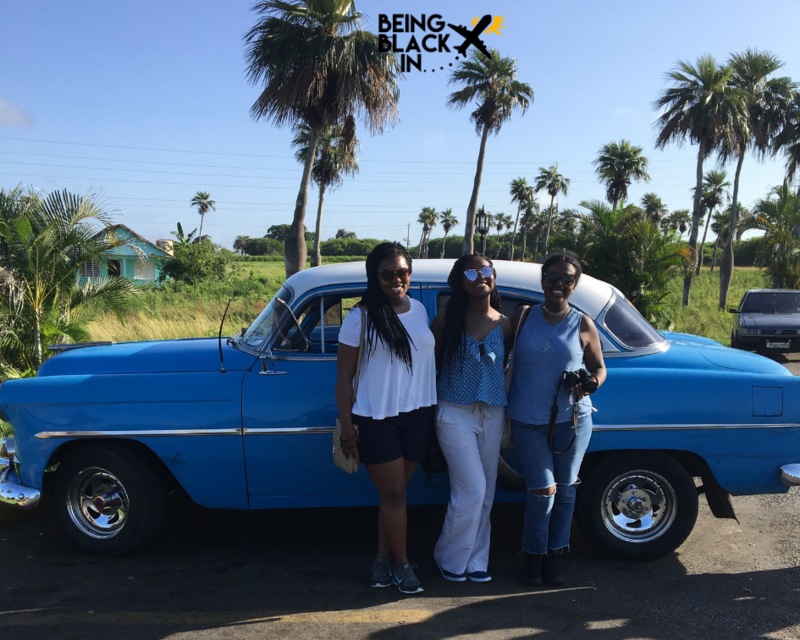 I was largely excited to test out my Spanish, take pictures next to old cars, and see these black Cubans I’d heard so much about. But I was a bit hesitant about the culinary experience I’d encounter. I’d read there was a lack of snacking options, I read about restaurants running out of food and closing early, and with regard to the taste of the food, opinions varied; so there wasn’t much I could do except pack a bunch of shelf-stable snacks and arrive with an open mind. Upon landing, the first activity we had signed up for was a cooking class. 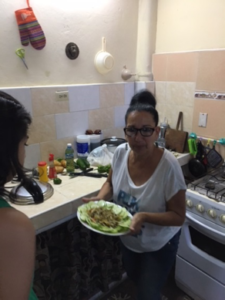 The adorable Cuban cook allowed a group of us into her home and (with a translator) talked through her process of making each part of the dishes. 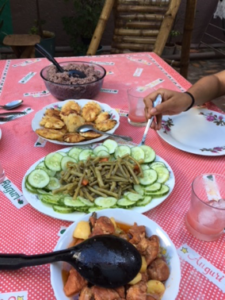 We watched her and helped her make rice and beans, fried plantains, a cucumber and green bean salad, and pork in a savory sauce. I noticed that she didn’t use many bottled seasonings. 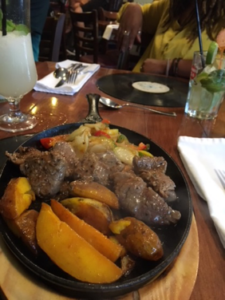 I was keen to observe that because I’d read that many Cubans don’t cook with seasonings due to lack of trade from the long history of being cut off from most of the world; additionally, the seasonings that are available are too expensive. Our host mashed a lot of vegetables—bell peppers, onions, garlic, tomatoes, etc. — as a base to give the food flavor. 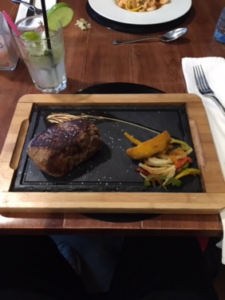 Ultimately, I still enjoyed my meal. Being aware that I wasn’t going to get explosive flavor prepared me to enjoy the subtle flavor that was present and the other variables like fragrance and texture. 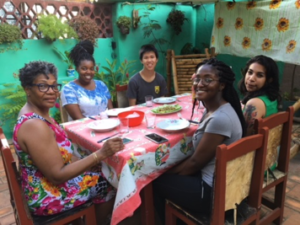 The following day, we did an Afro-Cuban religions tour and our host, Adriana, a gorgeous black Cuban, took us to a local home in Guanabacoa where a feast was prepared for our large group. 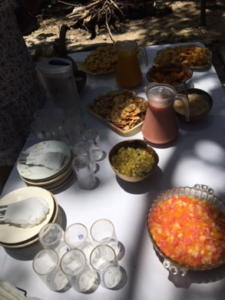 There were fried vegetable patties, plantain chips, a type of relish and sweet fruit custards, and this amazing fresh fruit drink. Even though it wasn’t richly seasoned, I still appreciated the variety of textures and the mix of sweet and salty. Plus everything tasted so fresh. Afterwards, one of the members of our tour group was celebrating a birthday and the entire group was surprised with one of the best cakes I’ve ever had in my life. 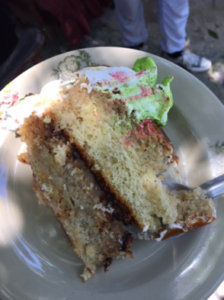 It was so rich and moist, but nothing about it was overwhelming. Adriana told us the woman who baked it was famous all around that neighborhood for her cakes. I had two slices because I simply lack self-control. 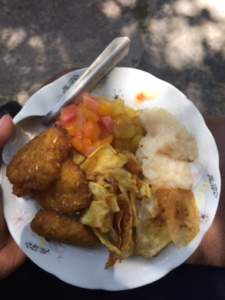 The best food I had in Cuba was at a very random restaurant in Vinalles, a town where a lot of tour groups go after visiting the tobacco farm. There was a noodle soup that was delicious. 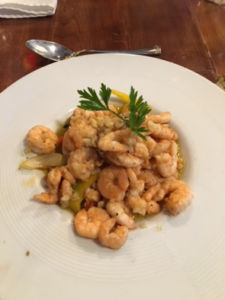 Throughout the trip, we ate European and American style dishes in small cafés and restaurants. Fresh juices are a big thing so we had lots of smoothies and fruit drinks. You really have to be careful with the foods; they use ice or tap water for many drinks and to rinse off fresh fruits and vegetables. It DOES NOT sit well with American stomachs. Try to stick to cooked foods. My favorite drink wasn’t a juice though, it was a coffee drink called café bombon. It’s condensed milk, coffee, and whipped cream. It was absolutely delicious and energizing. 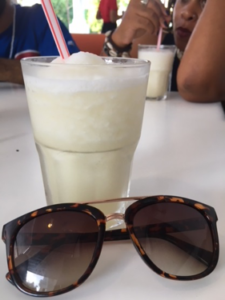 It’s not a specifically Cuban drink, more typical of all of South America, but because of the deliciousness of Cuban coffee, it was of course better. The only time I ate the snacks I packed was when I was flying to and from Cuba. I don’t know if it was because our days were so packed or because we genuinely weren’t hungry, but snacking wasn’t an issue with my group of friends. 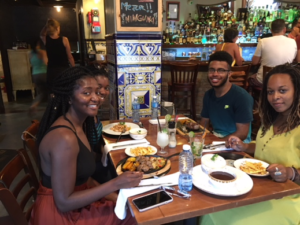 There was one small restaurant we encountered that did run out of some of the foods I liked, but truthfully, I’ve traveled well enough before Cuba to recognize now that that’s just a quirk of developing nations. The menus are aspirational sometimes. I absolutely enjoyed my time in Cuba. No, the country won’t amass any Michelin stars any time soon, but so what? Sometimes the experiences are more filling than the food. 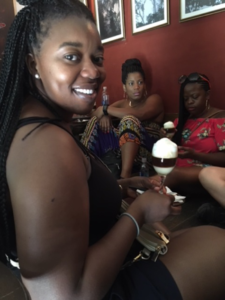 To read a different perspective of Cuba, check out Khadijah’s story.